The Outlander season 2 Blu Ray includes all the episodes from season 2. This is the complete season on high def blu ray. Season two of Outlander begins as Claire and Jamie arrive in France, hell-?bent on infiltrating the Jacobite rebellion led by Prince Charles Stuart, and stopping the battle of Culloden. With the help of his cousin Jared, a local wine merchant, Jamie and Claire are thrown into the lavish world of French society, where intrigue and parties are abundant, but political gain proves far less fruitful. Altering the course of history presents challenges that begin to weigh on the very fabric of their relationship. However, armed with the knowledge of what lies ahead, Claire and Jamie must race to prevent a doomed Highland uprising, and the extinction of Scottish life as they know it. 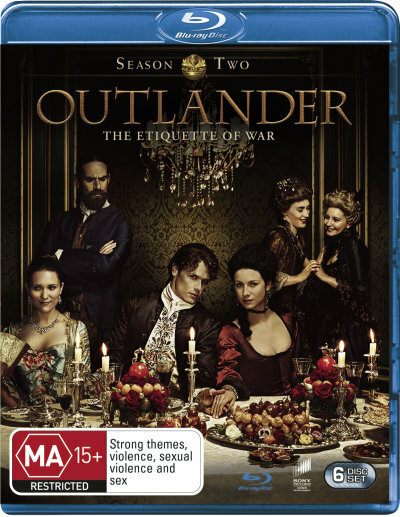 Click the button below to add the OUTLANDER - COMPLETE SEASON 2 (BLU RAY) to your wish list.